The early spring Wisconsin weather has not been very cooperative for the Madison Memorial boys and girls track team but the start of competition knows no waiting. 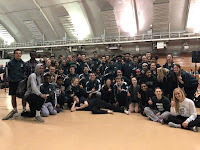 So, after two weeks of intense practice with close to 200 track & field athletes, a handful of varsity athletes traveled to the Kachel Field House at UW-Whitewater. This group competed against some of the best teams from Southern Wisconsin and Northern Illinois. Our very own Daurice F was named athlete of the meet for boys competitors with his wins in the 55 hurdles (7.61) and long jump (21' 2.5") along with being a member of the 10th place 4x4 relay team (including Courtney M, Tyler M, & Josh P). On the girls side we had an event champion in Corinne F with a PR throw of 36' 9" in the shot put. Also scoring points on the boys side was Josh P with 5th place finish in the 800m with a time of 2:03.3. Today's meet brought the first competition experience for many athletes and a number of PR's for returning athletes. Notable performances on the day include 7.15 by freshman Jake A in the 55 dash, a 10.09 by Mariah O-F in the 55 hurdles, a 9th place finish by Jonah W with a PR of 2:06.21 in the 800, Sienna C running a 1600 in 5:58.0 for her first track race, Christian M clearing 5' 6" in his first ever high jump competition, 11th place finishes by Bryce H in the boys and Sara N in the girls 3200, Jessi F in the shot put, and the boys 4x8 of Brad G, Ben B, Jonah W, & Jake R. A compliment to Jeremy G who was the first athlete to compete in the new boys track uniforms and threw a PR of 38' 00.25" in shot put competition. Today was a great starting point for the season. We hope to see continued improvement from the athletes who competed today and look forward to adding more athletes to the mix as we progress into the season. It is important that we put in the work now at practice and in the classroom so we can compete at our best later in the season. The end of 3rd Quarter is approaching...make sure we take care of our grades!! !